Update August 10, 2018: Google has confirmed that it has removed Topple Track from its Trusted Copyright Removal Program membership due to a pattern of problematic notices. Symphonic Distribution (which runs Topple Track) contacted EFF to apologize for the improper takedown notices. It said that “bugs within the system that resulted in many whitelisted domains receiving these notices unintentionally.” Symphonic Distribution said that it had issued retraction notices and that it was working to resolve the issue. While we appreciate the apology, we are skeptical that its system is fixable, at least via whitelisting domains. Given the sheer volume of errors, the problem appears to be with Topple Track’s search algorithm and lack of quality control, not just with which domains they search. At EFF, we often write about abuse of the Digital Millennium Copyright Act (DMCA) takedown process. We even have a Hall of Shame collecting some of the worst offenders. EFF is not usually the target of bad takedown notices, however. A company called Topple Track has been sending a slew of abusive takedown notices, including false claims of infringement levelled at news organizations, law professors, musicians, and yes, EFF. Once we identify pirated content we send out automated DMCA takedown requests to Google to remove the URLs from their search results and/or the website operators. Links and files are processed and removed as soon as possible because of Topple Track’s relationship with Google and file sharing websites that are most commonly involved in the piracy process. In practice, Topple Track is a poster child for the failure of automated takedown processes. Other targets include an article about the DMCA in the NYU Law Review, an NBC News article about anti-virus scams, a Variety article about the Drake-Pusha T feud, and the lyrics to ‘Happier’ at Ed Sheeran’s official website. It goes on and on. If you search for Topple Track’s DMCA notices at Lumen, you’ll find many more examples. The DMCA requires that the sender of a takedown notice affirm, under the penalty of perjury, that the sender has a good faith belief that the targeted sites are using the copyrighted material unlawfully. Topple Track’s notices are sent on behalf of a variety of musicians, mostly hip-hop artists and DJs. We can identify no link—let alone a plausible claim of infringement—between the pages mentioned above and the copyrighted works referenced in Topple Track’s takedown notices. The notice directed at an EFF page alleges infringement of “My New Boy” by an artist going by the name “Luc Sky.” We couldn’t find any information about this work online. Assuming this work exists, it certainly isn’t infringed by an out-of-date case page that has been languishing on our website for more than eight years. Nor is it infringed by Eric Goldman’s blog post (which has more recent news about the EMI v MP3Tunes litigation). EMI v. MP3Tunes was a case about a now-defunct online storage service called MP3Tunes. The record label EMI sued the platform for copyright infringement based on the alleged actions of some of its users. But none of this has any bearing on Luc Sky. MP3Tunes has been out of business for years. It is important to remember than even the most ridiculous takedown notices can have real consequences. Many site owners will never even learn that their URL was targeted. For those that do get notice, very few file counternotices. These users may get copyright strikes and thereby risk broader disruptions to their service. Even if counternotices are filed and processed fairly quickly, material is taken down or delisted in the interim. In Professor Goldman’s case, Google also disabled AdSense on the blog post until his counternotice became effective. We cannot comprehend how Topple Track came to target EFF or Eric Goldman on behalf of Luc Sky. But given the other notices we reviewed, it does not appear to be an isolated error. Topple Track’s customers should also be asking questions. Presumably they are paying for this defective service. 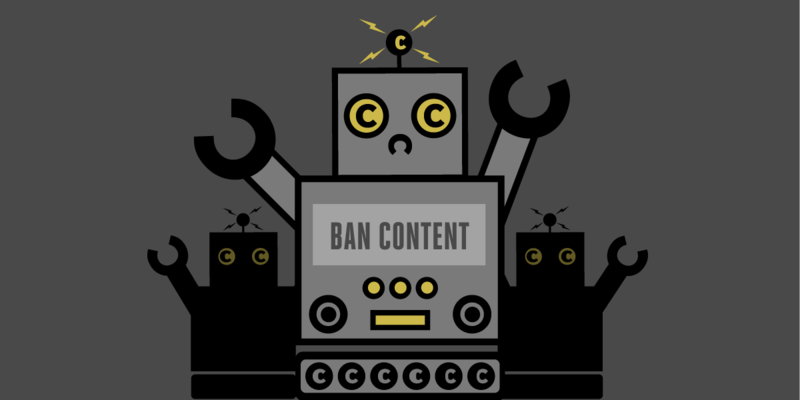 While Topple Track is a particularly bad example, we have seen many other cases of copyright robots run amok. We reached out to Google to ask if Topple Track remains part of its trusted copyright program but did not hear back. At a minimum, it should be removed from any trusted programs until it can prove that it has fixed its problems.